9K Yellow Gold, Gentlemans Cufflinks... Collar Studs ! 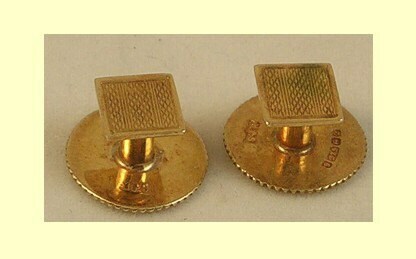 This is a superb pair of solid 9K carat Karat gold collar studs or cufflinks with engine turned decoration. The rear clasp bears a Birmingham hallmark date letter “Q” for the year 1990 and the maker’s initials “SJR”. The cufflinks are in splendid condition with the rear fastener having a diameter of 0.45 and the square to the front measures 0.25 inches square with a combined weight of 0.06 Troy ounces or 1.9 grams. We offer a 74 Day 100% money back guarantee if you are not completely satisfied with your purchase.